We can explore the full museum show in stunning detail, in the intimacy of our own environment, without glass barriers or crowds of visitors. This spectacular iteration of the iconic show includes over 50 high-res 3D costumes. Plus many never before seen items. 38 songs and more videos, live performances and original lyric sheets and design notes. And much more. 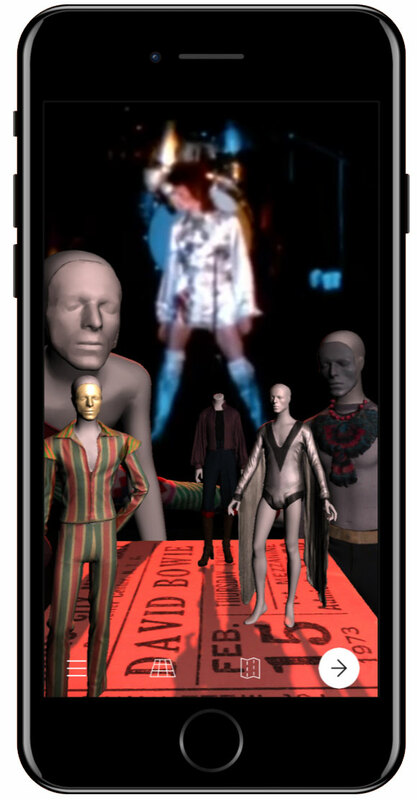 To celebrate Bowie’s birthday, a new AR mobile app for Apple and Android devices lets fans explore hundreds of items from the late singer’s life. The app, a collaboration between the David Bowie Archive and Sony Music Entertainment, is called “David Bowie Is,” a title bearing the same name as the touring exhibition that’s already attracted more than 2 million fans across 12 cities. 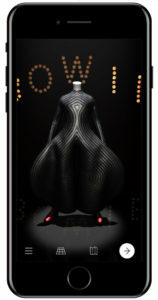 “David Bowie is” is an adaptation for iPhone of the blockbuster exhibition that originated in London’s Victoria and Albert Museum in 2013 and toured the world for five years to record-breaking attendance and international acclaim. 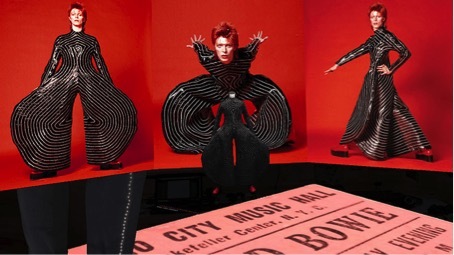 This augmented reality exhibition tells the story of Bowie’s life and career through costumes, videos, photography, drawings, storyboards, music scores, handwritten lyrics, letters, and diary entries. It displays over 400 items from the iconic exhibition in a sequence of 25 newly designed virtual exhibition rooms, with many never before seen items. No headsets required, all you need for the best experience is a pair of headphones. Courtesy of The David Bowie Archive, Sony Music Entertainment (Japan) Inc. and Planeta. 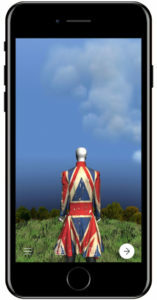 The app allows users to place a virtual version of the entire exhibition inside of their home or office. Along with narration from actor Gary Oldman, fans can examine more than 50 high-resolution costumes along with “videos, handwritten lyrics and original works of art,” according to David Bowie’s estate’s website. The app will also feature items that weren’t on tour, which ended in July after making stops in London, Brooklyn and other cities around the world. Upon opening the app, users are greeted with a reminder that “David Bowie showed us that we could be who we wanted to be,” before inviting them to tour through 25 rooms and 400 objects. The experience is meant to take place on a table top. After scanning the surface a costume appears, followed by the voice of Oldman as the viewer’s room transforms on the screen to pitch black, illuminated only by the object’s digital glow. After that, the costume disappears, and is replaced by a black and white photo of Bowie at six years old, along with some drawings ranging from a portrait of his mother to sketches for stage outfits. After learning about his early years, the scene transforms yet again to outer space, explaining the origin story of “Space Oddity” along with the history that influenced it. The iOS and Android app does serve more ambitious means, too. Comprised of over 400 Bowie totems assembled across 25 “rooms,” it imitates the approach of the V&A’s retrospective, arguably the most impressive music exhibit of the past decade. David Bowie Is… opened at the London museum six years ago and toured internationally before closing in Brooklyn last year, drawing some 2 million visitors along the way. The installation was as notable for its intimacies as it was its reach: Organized thematically more than chronologically, David Bowie Is… paid equal care to flashy relics and casual scraps of creativity from Bowie’s personal archives. The rooms were multisensory wonders, overlaid with all the other artforms he had mastered: glittering costumes and avant-garde music videos, hand-drawn tour sketches, bespoke studio equipment. David Bowie Is… could have been overwhelming, but instead it felt like a vessel of his spirit: joyously inclusive to all the possibilities of life, the more eccentric the better. As hapless visitors of New York’s Björk MoMA iceberg and Velvet Underground Disneyland ride will recall, this kind of curation is its own great relief. Like the exhibit, the app succeeds because of its breadth. (Also, the audio is perfectly timed and well mixed, another highlight of the museum experience.) The defining themes and personas of Bowie’s long career are all there, from his galaxy-hopping origin story to his impossibly gracious farewell, Blackstar. Many rarities are on display: my favorite piece of the exhibit, Bowie’s 1969 pantomime short film The Mask (A Mime), is available in full, as are his gorgeously eerie paintings from the Berlin years and his cut-up lyrics for “Blackout,” laid out like impossibly chic magnetic fridge poetry. Zooming in on these allows for gleeful scrutinizing on a level that museum hordes won’t permit, but elsewhere, the details aren’t always so faithful. Specifically, the costumes. The app also comes with exclusive content that was not found in the physical exhibit. This includes above all material about the concept album Diamond Dogs. With the app you can also watch clips from the 1974 album tour, enjoy excerpts from the experimental film on Diamond Dogs and live performances. David Bowie Is includes his costumes, songs, music videos and live performances, lyric sheets and design notes, photos, drawings and sketches and paintings done by Bowie. Each digitally scanned item can be inspected in astonishing detail at the viewer’s leisure, in their own environment, with no crowds or glass separating them from the intimate artifacts of one of the most influential artists in popular cultural history. For iPhones 6S, iPad 2017, iPad Pro and later models running iOS 11 and later. You do not need a VR headset to view this exhibition. Only the iPhone and headphones. The app requires access to user device’s camera and microphone in order to use augmented reality. However, no personal data is recorded or saved, and privacy is 100% guaranteed. 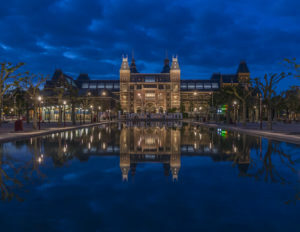 The app is based on the sensational 2013 Victoria & Albert museum exhibition David Bowie Is, which traveled the world for five years before ending at the Brooklyn Museum this past summer. By using over 400 high-resolution 3D graphics, the VR and AR studio Planeta digitally reconstructed the exhibit on behalf of the David Bowie Archive and Sony Music (Japan). Through the app one can approach the exhibits or just zoom in. Since the events take place completely in the app, one can actually speak contrary to the estimation of the manufacturers here of a pure VR app. In the exhibition, we can discover 60 pages of handwritten design notes and lyrics, 56 costumes, 50 photographs, 33 drawings and sketches, as well as 7 paintings that Bowie himself painted. One can also listen to 38 songs and watch 23 music videos and live performances. Bowie probably would have been pleased to have his friend Gary hosting his variety show. But does the AR appmatch, or better, the real thing? It’s “no match for seeing the costumes in real life,” or seeing Bowie himself in the flesh. But for the millions of people who never got the chance—a category that will soon include everyone—it may currently be the best way to experience the musician/actor/writer/one-man-zeitgeist’s career in three dimensions. See a preview of the app from Rolling Stone, above, and download the AR David Bowie Is for iPhoneand Android via these links. The cost is $7.99. A project by The David Bowie Archive, Sony Music Entertainment (Japan) Inc. and Planeta.